I felt that way with my first Star Trek convention. Some of those folks make Haruhi fans look tame. This episode went from good to bad to thankfully really enjoyable. 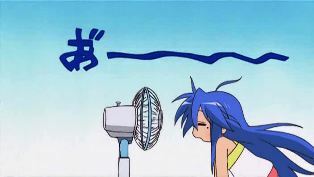 As funny as he is, I’m getting tired of Konata’s dad (but he’s not what I’m talking about at all). Maybe I’m seeing some shadow of myself, you know that whole “projection” thing that psychologists sometimes talk about. It’d be great to see him and Kagami and Tsukasa’s dad hang out. The whole convention segment was great, but having the same actor voice the extras sort of dampened the enjoyment factor. Thankfully Tsukasa’s predictable first-timer eagerness was pretty adorable. And then we came to the scene that killed the mood for me. Poor thing, she must know we’re coming to the worst part of the show. I really hate it when I don’t write down any notes about a show. The remaining little gray cells are over taxed as it is. I still think they should drop the Lucky Channel segment and give us more Miyuki. Spin off the Lucky Channel into it’s own series and give us a behind the scenes with an idol show. Something akin to Extras. That would be fun to see. Not much to say about these last few episodes other than they’ve really made Tsukasa stand out to me. She’s also had the best facial expressions of the show so far. Watching her dealing with her cell phone in episode 7 was funny. Watching her focus hard on her footing for the hurdle jump and then run the race had me laughing hard. 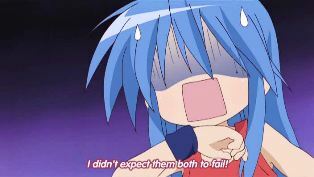 And Konata’s reaction to her when she talked about considering Konata’s chocolate cornet as a dessert. 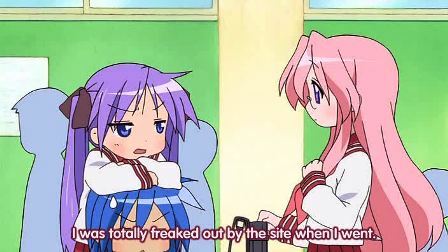 Konata’s reaction shows a real mean streak which was something I unconsciously felt that she had. Yeah sure, Konata’s a free spirit, but show her up in front of other people, well let’s just say that little miss stabby comes out. Then there’s Tsuakasa’s expressions in episode 9 when she tells us that she isn’t having fun. They just brought the humor of the show up to a higher level. 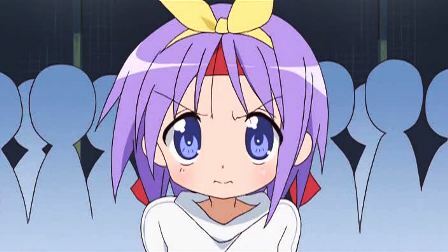 And vaulted Tsukasa so far ahead of Konata on my favorites list that there’s no hope for Konata at all. 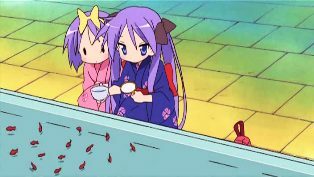 Of course, no one will ever come close to Kagami’s level. 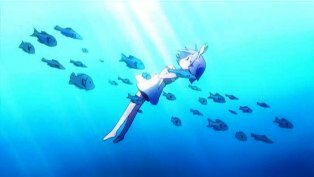 Why is it that nearly every beautiful/scenic underwater scene seems to always have some Enya/Clannad-like background music? I’m glad to say that I won my first debate about this show. Granted, I’ll be paying a lot for that win in my personal life, but a win is a win. And oh, how I’ll pay - I’ve already been warned. The tendency in the badger’s den, (by certain non-anime viewer who usually derides such entertainment only to watch vapid singing contests…and the occasional animes about high school girls) is to compare this show with Azumanga Daioh. Especially with the trip to the beach from both shows. 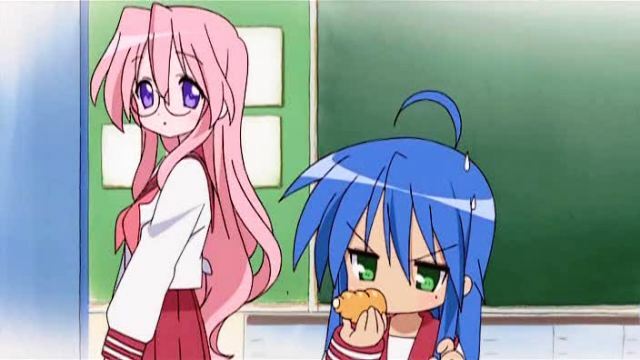 Take the speed demon of both shows - Yukari from Azumanga and Yui from Luck Star. One is an utter self-centered psychotic and the other isn’t. Then look at their driving skills, Yukari’s car reminded me of an episode of Top Gear where Jeremy Clarkson drives a Toyota pick-up around Brighton, trying to the destroy the truck. Instead, he nearly destroys Brighton (I hope my truck is just as durable). Yui, well, I’d love to see what she can do in the Mach Five. Then there’s Nanoka, whose a little like Yukari, with a “Party on” attitude…minus Yukari’s tendencies to endanger those around her like that of a Hayward bus driver’s “The next stop is the last stop…and I’m taking you all with me because I’ve finally snapped” glare. 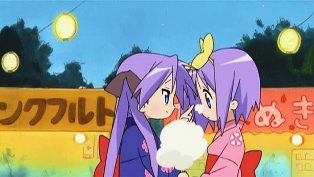 Lucky Star - I..uh..I liked it?! Ok, Yet another thing I seem to admit to on this blog. 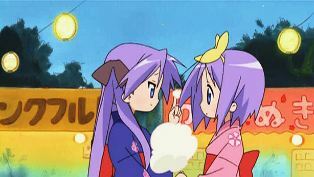 I liked Lucky Star. I went into it not expecting to like it based on other blogs that I read and like. My dislike of the opening reinforced what I’ve read. In fact, I barely made it through the OP. That song was just…is “blargh” a legitimate word? 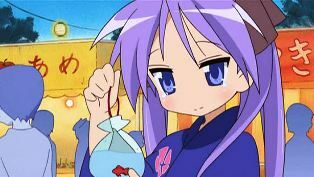 While I had originally planned to watch Lucky Star because its of Kyoto Animation, I then had to watch it just to see how bad it was. One of the things I had set in my mind was that even an outfit like Kyoto Animation could strike out on a show every once in a while. Even though they’ve delivered some of my favorite shows, I was allowing for disappointment. Based on what I read, I thought Lucky Star was it. Well, I was wrong. Somewhat. I don’t like the OP song. It’s blargh. However, with the sound off, its pretty enjoyable to watch. Other than that, I was chuckling throughout a lot of the show. Granted, the high school girls and their eating styles could’ve been a little shorter, but that’s where I was laughing the most at, what I thought, was the ludicrousness of such a long segment about eating. But the more it went on, the more I laughed because I knew this wasn’t going to wind up anywhere. I suppose that it’s easy to compare this show (or even Hidamari Sketch which I like, but sometimes find hard to watch) to a show like Azumanga Daioh. For me, Azumanga Daioh sort set the standard for these types of shows. 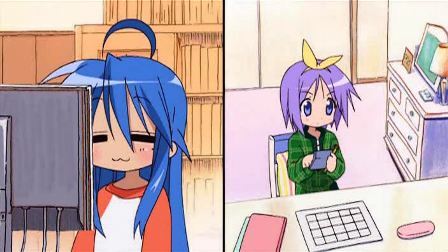 However, the more I watch Lucky Star (well, this one episode), I’ve actually stopped making comparisons. I get the feeling that Azumanga Daioh will be the better of these two shows (actually, make that three shows since I’m including Hidamari Sketch in this group). 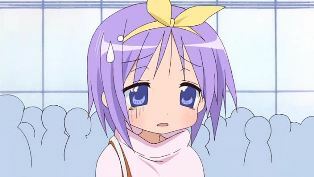 But I’m not committing myself to that until the end of Lucky Star’s run. I will say that I get a sense of “nostalgia” when I watch Azumanga Daioh which pretty much appears with the first episode of that show. With Lucky Star, I haven’t gotten that feeling yet. 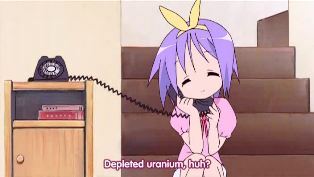 I don’t even know if I will, but there’s definitely a sense of humor in Lucky Star otherwise I wouldn’t have laughed as much as I did. I don’t know if the humor is (or was) subtle, but I did enjoy watching this episode. 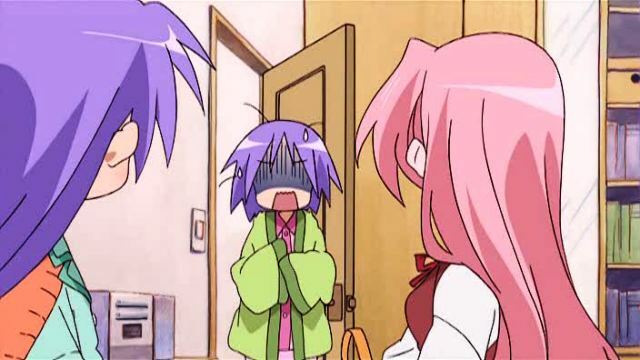 I guess I shouldn’t be surprised at all that I liked Lucky Star when other bloggers didn’t like it. I have a slight contrarian streak. 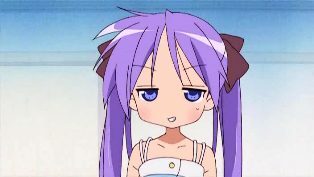 I guess it’ll take a few more episodes for me to decide if it really is that contrarian tendency rearing up its ugly head or that I actually like Lucky Star.